TriMet will launch the highly anticipated TriMet Tickets app on Wednesday, Sept. 4. 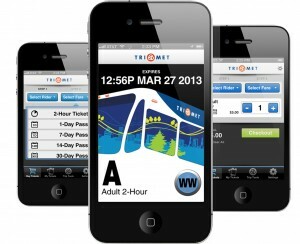 The free smartphone app will make riding TriMet that much easier. You’ll be able to conveniently and simply buy and use tickets on your Android or iPhone – anywhere at any time. No searching for exact change; no stopping at a ticket machine; no keeping track of your ticket. With a few taps on the screen, your ticket will be right there in the palm of your hand. Use it to ride buses, MAX trains, WES Commuter Rail and the Portland Streetcar. “We are committed to improving the rider experience, which TriMet Tickets app will do by simplifying fare purchases and moving us a major step forward toward an electronic fare system that will bring even more benefits for our customers,” said McFarlane. On September 4, download the free TriMet Tickets app from an Android or iPhone app store. Register your account and load your credit or debit card information into the secure system and then you’re ready to buy tickets. It’s that easy! For more information and a how to video, visit trimet.org/mobiletickets. Whether you are an adult, youth or an honored citizen, you will be able to buy 2-Hour tickets, 1-Day passes, 7-Day passes, 14-Day passes and 30-Day passes for immediate or future use. There’s a minimum $5 purchase required but the tickets you buy, such as two Adult 2-Hour tickets at $2.50 a piece, can be activated individually. The TriMet Tickets mobile ticketing app takes us a big step toward a state-of-the-art electronic fare system that we will begin implementing in 2015. Like the mobile ticketing app, the eFare technology will be simple to understand, easy to use and convenient. It will also allow customers to enjoy features such as stored value, convenient purchasing and real-time reloading, online account management and payment protection.